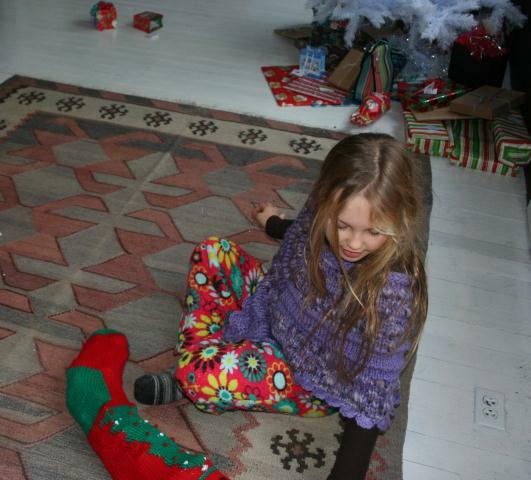 Just like last year, I was frantically trying to finish Stella’s Christmas present! I finished with 3 days to spare!!! 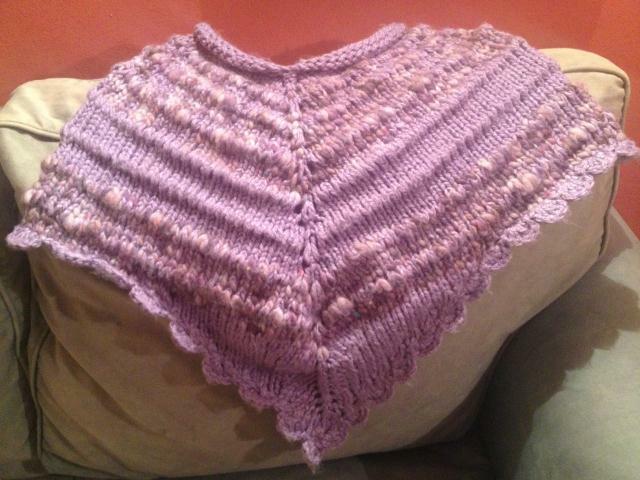 She had requested a poncho for her birthday, but time was not on my side – so the request was pushed to Christmas. I searched and searched for a pattern, but I never did find one that felt “right” for Stella – so I came up with my own pattern (yikes! and would it come out right?!). Wasn’t sure how to end it, but I think the 1 view worked out nicely and she can always tell what side is the front! 1. 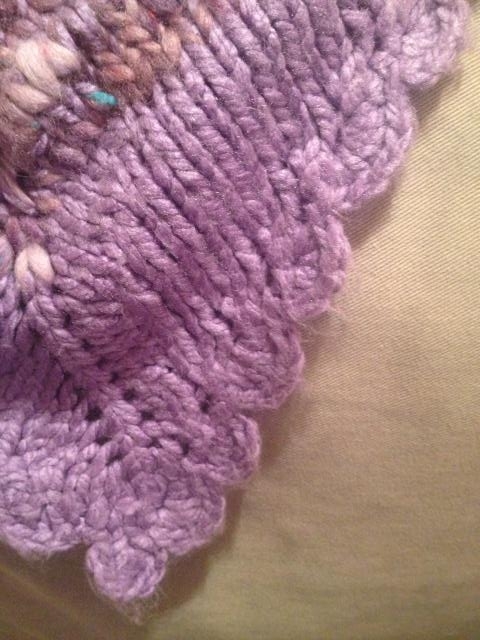 With 2 strands of the solid color, on double pointed needles CO (cast on) 62 stitches. 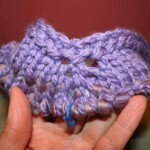 Divide stitches evenly on 4 needles and join in a round being careful not to twist. Place marker at beginning of round. Repeat Round 10 – 15 until piece measures approximately 14 inches from neck to bottom. 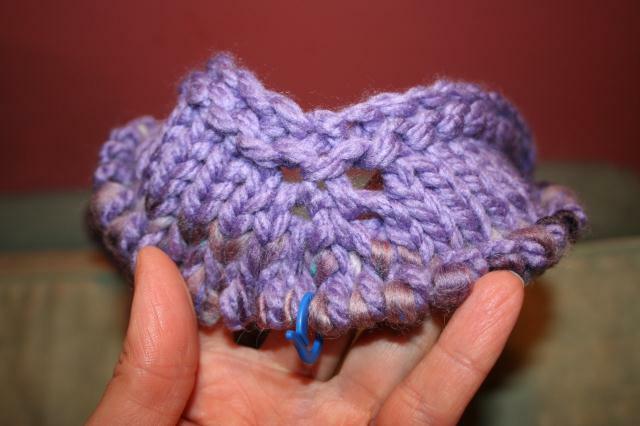 I made a pattern with the yarn – using 1 strand solid and 1 strand accent, for several rows, then switching to 2 strand solid – and did that pattern twice. 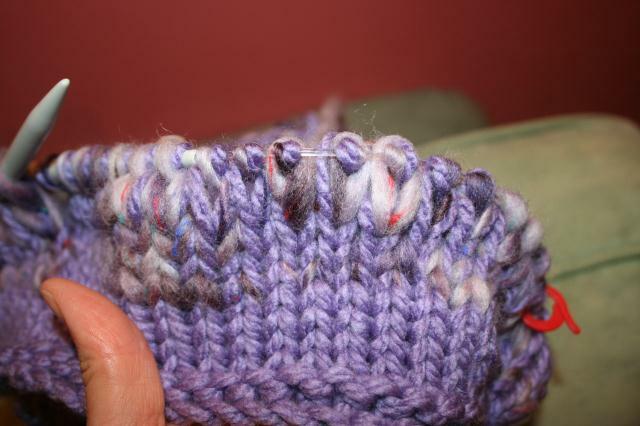 When piece measures 14″, BO (bind off) all stitches EXCEPT 20 stitches before and 20 stitches after 1 increase marker. Row 3: K1, K2tog (knit 2 together), K9, K2tog, K4, M1, move marker, K1, M1, K3, K2tog, K9, K2tog, K1. Row 5: K1, K2tog, K8, K2tog, K3, M1, move marker, K1, M1, K2, K2tog, K8, K2tog, K1. Row 7: K1, K2tog, K7, K2tog, K2, M1, move marker, K1, M1, K1, K2tog, K7, K2tog, K1. Row 9: K1, K2tog, K5, K2tog, K2, M1, move marker, K1, M1, K1, K2tog, K5, K2tog, K1. Row 11: K1, K2tog, K3, K2tog, K2, M1, move marker, K1, M1, K1, K2tog, K3, K2tog, K1. Row 13: K1, K2tog, K1, K2tog, K2, M1, move marker, K1, M1, K1, K2tog, K1, K2tog, K1. Row 15: K1, K2tog (twice),K1, M1, move marker, K1, M1, K1, K2tog (twice), K1. Row 17: K1, K2tog, K1, M1, move marker, K1, M1, K2tog, K1. Row 19: K2tog, K1, M1, move marker, K1, M1, K2tog. 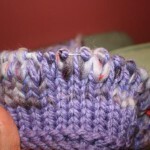 Cut your yarn and pull through last stitch, weave in ends. Weave in all ends and block. I had thought that I would do fringe all around the edge of the poncho, but lucky me – I was at my aunt’s and she offered to do a crochet border!! It came out wonderfully. I finished a few days before Christmas and on Christmas morning Stella opened her gift and loved it!! It has been worn often since. 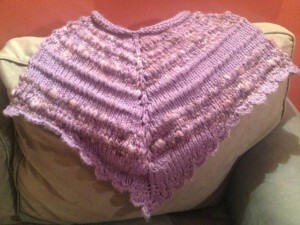 This entry was posted in Crafts, Knitting and tagged child, crafts, knitting, pattern, poncho. Bookmark the permalink. Pamela, you should consider taking additional pictures of the finished project and set up a shop over at Craftsy for your ‘indie patterns’. 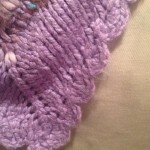 Your designs are quite nice, Craftsy is free; you’d certainly have nothing to loose ! Thanks for the suggestion – I will look into it! Wow. The poncho looks great on Stella!! : ) You came up with a good pattern. The poncho was even prettier than the pictures show. The color really suits Stella!